The College of Cross-Cultural and Multidisciplinary Studies will hold an orientation and demo lessons according to the schedule below. Please come and experience the classes in English for Terms 3 and 4. 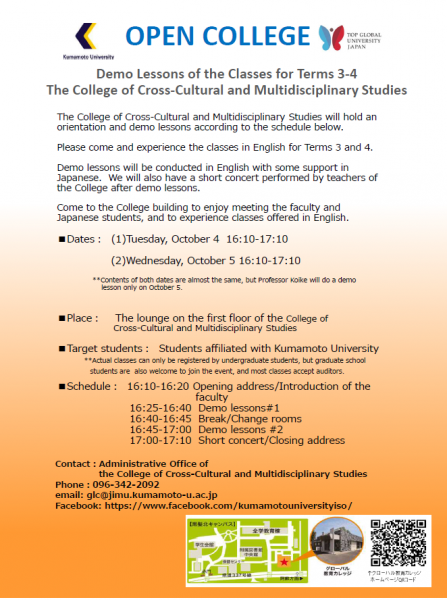 Demo lessons will be conducted in English with some support in Japanese. We will also have a short concert performed by teachers of the College after demo lessons. Come to the College building to enjoy meeting the faculty and Japanese students, and to experience classes offered in English. **Contents of both dates are almost the same, but Professor Koike will do a demo lesson only on October 5.
students are also welcome to join the event, and most classes accept auditors.